You can use your Xbox One controller to control both Blu-ray discs and DVDs that you’re playing in your console. This page shows you how, as well as pointing out the features on your controller that you’ll be using. 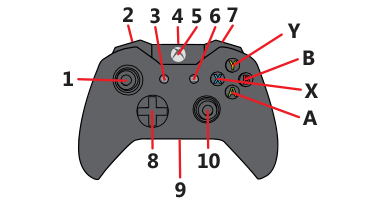 Note For a full explanation of the buttons on the wireless controller, see Get to know your Xbox One wireless controller. The following table describes the controller shortcuts you can use to control the playback of Blu-ray discs. Note This feature isn’t supported by all discs. The following table describes the controller shortcuts you can use to control the playback of DVDs. Would you like to contact Support regarding the "Control Blu-ray and DVD discs on your Xbox One console" issue you were reading about or a different issue?